'Arrow' Clarifies the Status of The Huntress in "Divided"
Arrow returned from midseason hiatus tonight, and it revealed the current status of a long-running fan-favorite. Spoilers for tonight's episode of Arrow, "Divided", below! 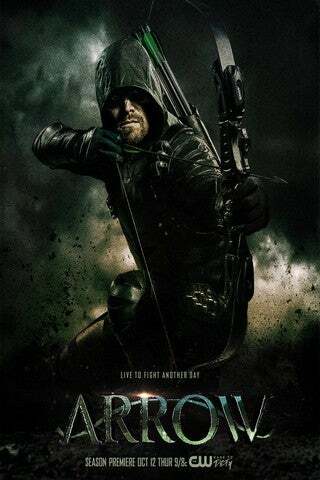 Tonight's episode saw Oliver Queen (Stephen Amell) being asked for help by Jerry Bertinelli. When Oliver asked why Jerry couldn't just ask his cousin, Helena Bertinelli/Huntress (Jessica De Gouw) for help, Jerry remarked that she'd "gone underground." If you're unfamiliar with Arrow's version of Huntress, here's what you need to know. Helena first debuted early on in Season One, where she served as a love interest and protege of Oliver. She then reappeared in the Season Two episode "Birds of Prey", which placed both Sara Lance/The Canary (Caity Lotz) and Laurel Lance/Black Canary (Katie Cassidy) in her crosshairs. Helena was incarcerated shortly after, where she's been within the show's standing until today. And now that she's somehow escaped, there's a very good chance she could return in some way -- something that fans have been hoping for for a while. "I want to say, 'Absolutely,'" executive produer Marc Guggenheim said about Huntress' potential return. "Jessica De Gouw has expressed an absolute willingness to come back. Jessica’s a favorite actor of mine, and the Huntress is a favorite character of mine. I want to make it happen in Season 6. We’ve got some plans for the later half of the year that I think she will fit into really well, so we’ll see." So, could Huntress make a return to Arrow? Fans will just have to stay tuned.